Norman Bethune was born into a Scottish-Canadian family in the small Ontario town of Gravenhurst, his forebears largely medical practitioners and/or Presbyterians. He attended the University of Toronto, eventually earning a degree in medicine, practised medicine in Montreal, and was apparently a highly innovative physician, since his design of the Bethune Shears for chopping open the rib cage is still used today, 75 years later. That’s the good part, viewed from a contemporary Conservative – or conservative – point of view. However, interspersed with that classic Canadiana, he (1) interrupted his studies to be a stretcher-bearer – shrapnel-wounded – in the War to end all wars, (2) joined the Communist Party of Canada in 1935, (3) took part in the Spanish Civil War in 1936, along with other good-guy Communists like Ernest Hemingway and the English poets of the time, where he (4) devised a revolutionary system for supplying blood transfusion close to the front, thereby saving many lives, (5) in 1938 he joined Mao-Zedong’s (or whatever the current spelling is) Army contra both the Japanese invaders and the Chiang Kai-shek capitalists and, as a result, (6) he became a Chinese super-hero, patron saint and revolutionary icon. The greatest living Canadian example of a prophet who (because he was largely ignored back home) was not without honor, save in his own country. He died, almost unnecessarily, from an accidental scalpel cut on his finger during battlefield surgery, and the ensuing blood poison, occurring in less than clinical conditions. To say that he was buried in China with full military honors would be a gross understatement. He is enshrined in that country with all the national pomp, ceremony and prestige normally reserved for warlords, emperors, ancient dynasty members and contemporary members of the Politburo. Bethune is buried in the Revolutionary Martyrs’ Cemetery in Hebei Province, ensconced in a tomb and memorial hall. He is a household word to millions of grade schoolers – in Guandong Province, if not Owen Sound. Dr. Norman Bethune was obviously, by any criterion, a devoted physician, a humanitarian figure who not only fought the good fight but committed himself to great causes all his life. He was also, socially and morally, a bit of a nut case. He married what has been described as an extremely beautiful Scottish woman whom, when he later contracted tuberculosis and believed himself to be at death’s door, he persuaded to divorce him and return to Scotland. He thereupon recovered and begged her to remarry him, which she hesitatingly did. Ante-climactically, the marriage broke up two or three years later. 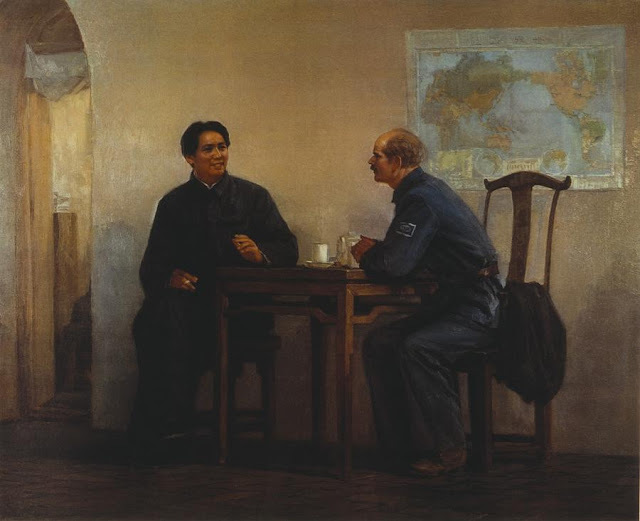 Almost unknown in his own country, at least while he was alive, Bethune was immortalized by none other than Chairman Mao, who had been a lowly field-grade commander when Bethune served in his army. In 1939, Mao published an article “In Memory of Norman Bethune,” which devoted considerable detail to Bethune’s final months in China. It became mandatory reading for every Chinese school child, as late as the 1960s. Comrade Bethune’s spirit, his utter devotion to others without any thought of self, was shown in his great sense of responsibility in his work and his great warm-heartedness towards all comrades and the people … We must all learn the spirit of absolute selflessness from him. With this spirit everyone can be very useful to the people. A man’s ability may be great or small, but if he has this spirit, he is already noble-minded and pure, a man of moral integrity and above vulgar interests. Speaking of vulgar interests, just recently the Stephen Harper government in Canada, intent on improving diplomatic – and particularly economic – relations with the mega-nation rapidly overtaking North America as the most powerful world economy, realized that they had been missing a bet with the forgotten medic from Gravenhurst. Granted, more recently, Bethune had been granted a smidgin of recognition, first under the reign of Pierre Trudeau, whose government purchased the manse in which Bethune was born and converted it into a tourist attraction (following Trudeau’s visit to China), principally of interest to touristing Chinese. Then in 2000, the Governor General, Adrienne Clarkson, conveniently of Chinese extraction herself, unveiled a bronze statue of Bethune. It stands in front of the Opera House on the town’s main drag. For an assistant queen to dedicate a statue in front of the Gravenhurst Grand Opera House speaks volume for Bethune’s recognition in Canada. Au contraire, the Norman Bethune Medal is the highest medical honor in China, recognizing an individual’s outstanding contributions, heroic spirit and great humanitarianism in the medical field. The Norman Bethune Medal was established in 1991, and is dished out to perhaps seven or eight physicians in China every year or so. In addition, Bethune has been remembered, Canadian style, in film and literature. Notably, Donald Sutherland, Canada’s favorite artistic export, starred in the 1974 television opus “Witness to Yesterday,” sponsored by Shell Canada. Sutherland went on to figure in two biographical films on the Canadian medical hero, both logically entitled “Bethune,” and one of which co-starred Helen Mirren, as the on-again, off-again Mrs. Bethune. Tony Clement, Canada’s (Conservative) Minister For Northern Economic Development, has been one of the distinguished idolators of Comrade Bethune, for all the right economic development reasons. The convolutions of politics for economic purposes is commonplace, but in this case, said a Toronto writer, Clement required the contortions of a chiropractor. Clement had made an appearance recently to open a new $2.5-million interpretive center at Bethune’s birthplace. Gravenhurst just happens to be in Clement’s home constituency. While 15,000 Chinese tourists and Chinese Canadians annually visit Bethune’s birthplace, those numbers could soar now that Canada recently revised approved-destination status for Chinese tour groups. Entrepreneurship? Yeah, right. Marxist or not, in the Thirties Norman Bethune obviously was just a good old free-enterpriser at heart, with his advanced field equipment and his rib-crunching surgical invention. A neo-conservative under the skin. “Human characters can be reinvented for a lot of purposes,” said Paul Evans, director of the University of British Columbia’s Institute of Asian Research. I agree. As for the flack in the PMO who came up with the resurrection of Dr. Norman Bethune, I think he deserves The Order of Canada with oak leaf clusters. Bill Annett writes three newsletters, The Canadian Shield, American Logo, and Beating the Street. He can be reached at: bilko23@gmail.com.Read other articles by Bill.